I find as I get older Christmas comes around much quicker! Is this just me or does everyone over the age of 30 feel the same? And, I find I am going to more funerals than I am weddings. 2010 was an absolutely dreadful year for my family having lost 3 uncles or aunts! On a happier note, I managed to go to the last meeting of the year at my local Camera Club. I really enjoy the camaraderie there, but unfortunately, due to pressures I can’t always manage the time. This week was different though, and it was a subject that is really close to my heart, Birds of Prey. I simply adore them, Owls, Hawks, Eagles any of them. So you cam imagine how pleased I was when I read that a local Birds of Prey rescue centre were bringing along a few birds for us to see and photograph? And, it was done in a really nice and respectful way, respectful to the birds that is. A number of checks were made first to see if the birds would mind any flashes going off. Once this had be checked and agreed that the birds were quite happy with the set up, they posed very comfortably, and soon made it quite clear when they had, had enough. A mention for club member Tony Barnett who managed the whole affair (or seemed to as far as I was concerned) he made sure that only one photographer at a time could photograph the bird. This meant of course that it wasn’t like a Paparazzi scrum! Many thanks Tony, and also to those other members who helped out so professionally on the night. There was one special little Owl there that I just fell in love with. 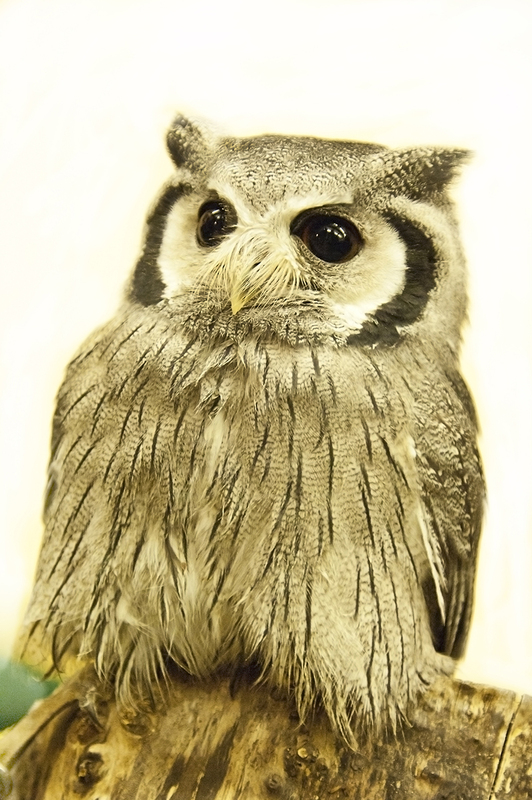 He was about 10″ high and was a White Faced Scopse Owl and I think he was about 10 years old. I spent a great deal of the night laying on the floor trying to get down to his level. I have one pic here but will post more on another occasion.